Members of the Lagos State House of Assembly have adopted Babajide Sanwo-Olu as the candidate they will support in the coming governorship of the state's chapter of the All Progressives Congress (APC). According to a statement by the Chairman of the House Committee on Information, Strategy and Security, Honorable (Princess) Adefunmilayo Tejuoso, the decision was taken at a parliamentary meeting of lawmakers held at the Lateef Jakande auditorium on Saturday, a day before governorship of the party. The meeting was presided over by the Speaker of the House, Hon. Mudashiru Obasa. 36 members were present from the 40 members of the House and all of them endorsed the decision and signed the statement announcing the decision. Hons. Segun Olulade and Abiodun Tobun both from Epe constituencies 1 & 2, the same place as Governor Akinwunmi Ambode were absent including Hon. Sikiru Osinowo who is said to be outside the country. 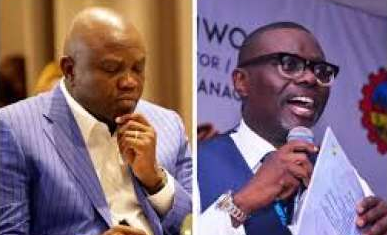 The lawmakers said they were in agreement with the leadership of the party and the Governor's Advisory Council (GAC), which had previously endorsed Sanwo-olu for the governorship ticket. "At the Parliamentary Meeting held on 29th September 2018 at the Lagos State House of Assembly Complex, the members unanimously resolutely support the position of the Leadership of All Progressive Congress (APC) and the Governor's Advisory Council (GAC) in Lagos State on the endorsement of Mr. Babajide Sanwol as the APC Gubernatorial candidate in the 2019 election. The meeting was attended by 36 out of the 40 Honorable Members in the House of Assembly. " In a similar development on Saturday, at a meeting held at Ikoyi's Sanwo-Olu Residence, Obafemi Hamzat, the third aspirant in the tripartite governorship race, Mr. Obafemi Hamzat stepped down for Sanwo-Olu calling on his supporters to vote massively for Sanwo-Olu at tomorrow's direct primaries which will take place all over the state. Hamzat described Sanwo-Olu as a man of integrity who is competent to handle serious business of governance.